been working on stretching out my new riding boots over the past few days... it was torture at first, but they are finally getting to where i want them to be! i used the trick of putting rubbing alcohol on the inside then wearing them... can't believe how well it worked. i should have a jump lesson tomorrow... unless it rains, them we'll be in the indoor for dressage! c. Booth 4-in-1 Multi-Action Passion Fruit Body Lotion smells completely amazing... i smelled all four of their 4-in-1 lotion line and wasn't a fan of any but the passion fruit... but it only takes one! a teensie bit of this product goes a really long way... and coming in at 32 fluid ounces, you will not have to purchase this often. i love the slip of this product and it dries down nicely... it's not one that stays wet feeling (which i definitely appreciate!). 1. Exfoliates: Malic Acid works tirelessly to ditch dead skin cells and even out skin tone, helping sun-damaged areas look healthy and happy. 2. Hydrates: Sweet Almond, Apricot Kernel and Shea Butter oils work in perfect harmony to hydrate thirsty skin. 3. Nourishes: Antioxidant vitamins and minerals valiantly fight off harsh environment forces that threaten skin health. 4. Firms: Caffeine wakes up less-than-taut skin, helping to firm and rejuvenate! 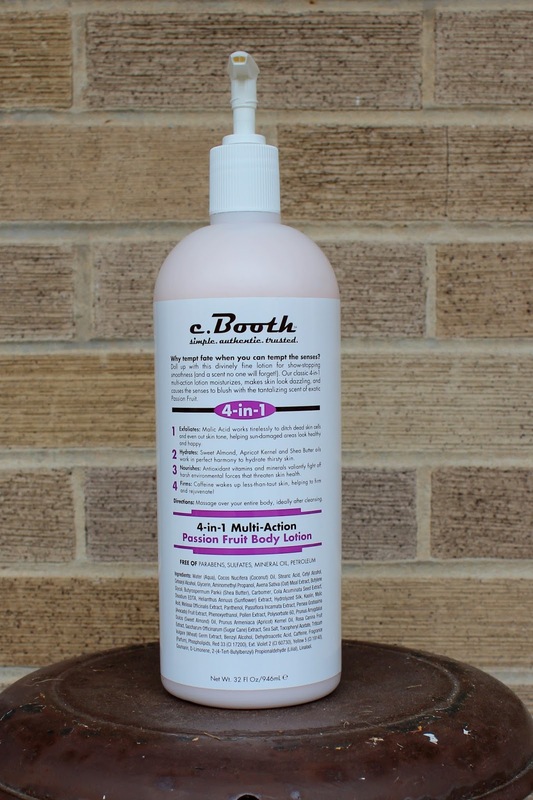 you can purchase c. Booth products on their C. Booth website and in lots of stores nationwide in the US. c. Booth is owned by Freeman Beauty, and you can use the store locater on the website to find places Freeman Beauty products are sold :) Freeman Beauty's website houses all their brands, making it easy to check out other products! c. Booth 4-in-1 Multi-Action Passion Fruit Body Lotion retails for $9.99, but when i got it at Ulta, it was on sale... so make sure to stay up with sales if you are looking to grab one! i've used other c. Booth products in the past and have found them to be a solid brand... have you tried anything by them? what do you think?